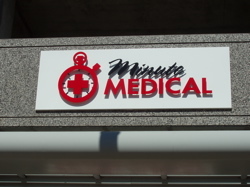 Acrylic letters provide a lower cost dimensional solution to interior or exterior signs. Multiple color options and specialty mirrored surfaces provide a finished look without the cost of painting or special finishes. Back painted clear acrylic provide custom coloring with unique lighting effects at an affordable price. Standoff mounting adds to the dimensionality with extra shadowing. Acrylic products are designed to be durable enough for outdoor use, but beautiful enough for indoor or in any application where precision is required. Design Flexibility to the extreme. From 1/2" to 72" letters with a polished edge. 32 standard colors or choose a custom finish. Colored mirror acrylics or back painted clear for unique lighting effects. Your artwork is converted to an exact 3-dimensional acrylic replica. Where to use Cut Acrylic Letters. When an intricate letterstyle or logo is required. On designs with multiple layers and colors. When working with a limited budget. Indoor signage that falls under the closest scrutiny. For examples of our cut acrylic lettering & logos, please visit our Product Gallery.